Enjoy Nature's Way Alive! Pea Protein Shake Vanilla. Alive! Ultra-Shake Pea Protein Is The Most Complete Daily Energy Supplement Shake. It's Also A Comprehensive, Whole Food Multi-Vitamin With The Added Benefit Of Pea Protein. 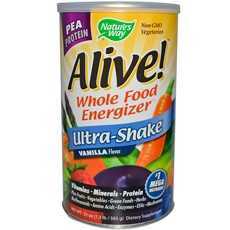 Each Serving Contains More Invigorating Nutrients From More Natural Sources Than Any Other Supplement.Delicious Powdered Shake Mix Version Of The Alive! *Mega Nutrient* Formula Found In Tablets And Capsulescomplete Protein With 18 Amino Acidsvegetarian, Non-Dairy Alternative To Whey And Soy Proteinbetter Digested With Less Allergen Potential Than Whey Or Soy Proteinnaturally Filling To Lessen Appetitemore Fiber And Less Carbs Than Other Whole Food Energy Shakeseasy To Mix, No Blender Required; (Note: Description is informational only. Please refer to ingredients label on product prior to use and address any health questions to your Health Professional prior to use.